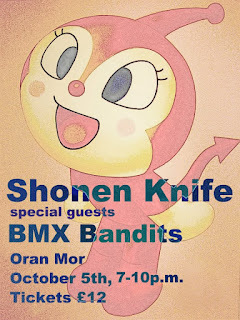 Shonen Knife, BMX Bandits, cool poster. A quick check to see what was on in Glasgow tonight to entertain me on my birthday found that it either Chris Isaak at the Royal Concert Hall, Disney on Ice at Braehead or Shonen Knife at Oran Mor. So with that to choose from it was up the top of Byres Road to see Osaka's best all-girl punk/rock/ pop band. Small Gang did a brave performance to an empty room with that ever popular 7pm stage time. For a change they got on with it and didn't just "harumph" for 45 minutes. The three piece from London I think between them maybe have some Goodbye Mr Mackenzie, Bloc Party and Nirvana records in their cupboards. They sounded more original and were at their best when singing over more drone-y guitars and had some solid drumming throughout. Next up, Bellshill's finest (if we ignore the Soup Dragons, the Vaselines, Teenage Fanclub and most of Mogwai) BMX Bandits. Duglas T Stewart is still there up in front, with a line-up which has ebbed and flowed over the years. I think that last time I saw him perform it was after the River Detectives at a freebie thing in Kelvingrove Park a decade or two ago. However 20 years ago they toured with Shonen Knife, making tonight a kind of reunion gig. Noted as the band Oasis were supporting when they first toured the UK, they also famously had Kurt Cobain as a fan apparently. Whilst Kurt and Oasis are long gone, BMX Bandits still trundle on with their pleasant indie pop they've been doing since 1985. They opened with Serious Drugs and then carried on with their songs which could all be imagined with wee tweety cartoon birds circling the stage whilst Duglas or Rachel Allison sung. Nice, but he is not quite the 60s French teenage chanteur he imagines. I liked his Big Bird t-shirt but is it an anti-Romney dig, or just him showing how 'kooky' he is? Anyway by the end of their set there were a few people smiling and swaying along merrily at the front. I'm just a bit too cynical to believe that someone can be jolly like that without being either a weirdo or a fraud. Japan has a unique skill of producing smiley, plastic pop with enthusiasm and sincerity. 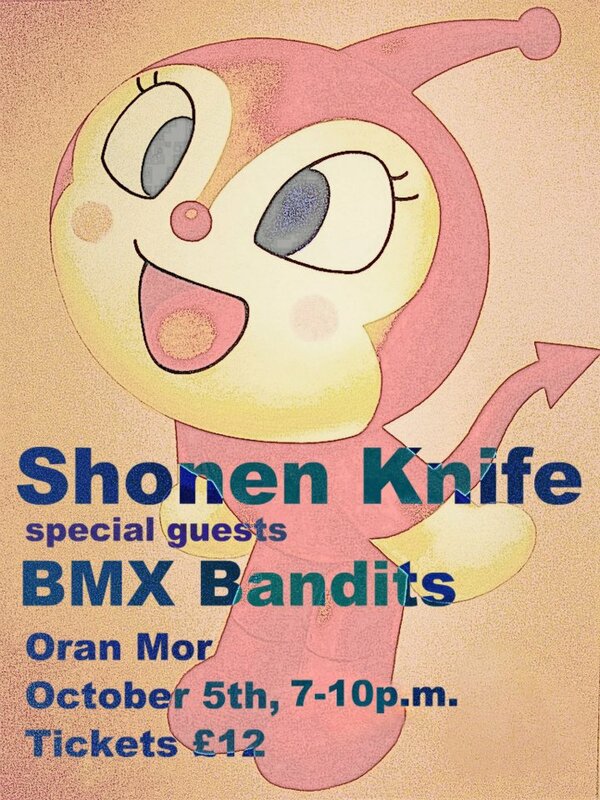 As soon as Shonen Knife come on stage you know it is going to be good. With two smiling, head banging guitarists in pink and orange A-line dresses out front of stage and the similarly attired drummer behind them Shonen Knife are a fantastic live act. The sometime Ramones cover band are in the UK promoting their 19th or 20th album, Pop Tune, which as the name suggests has some brighter, cheery pop on it than some of their more rock efforts. From the new album they played the cover track and Osaka Rock City with as much bounce and head banging as the rest of the set. Giggling like schoolgirls after slipping and falling over in the opening number, it was a sure footed performance after that, highlighting the fact that they've been playing for years now in one form or another. Everyone on stage was nice enough to give it big "I love being in Glasgow, I love Glasgow bands", which always goes down well, but the audience were eating out of their hands from the off. For a birthday night out they were perfect, bouncy fun, even if their chat hints at weird shadows on their psyche - "I am very ashamed, to sing about love, so I prefer to sing a song about a Rubber Band, a very useful item, to wrap up potato chips or bag of cookies"